Listen to them play their hymn-like ballads, township dances, venerable standards, riff tunes, pop songs. Hear them move from one to the other in seamless but brilliantly negotiated transition, sometimes splintering the elements of one before introducing and blending in pre-echoes of the next. Experience the sensation of being blown away by the waves of emotion, whether overwhelmingly ecstatic or exquisitely refined. And most of all, perhaps, listen to the Louis Moholo Moholo Quartet to understand how, in this music, the individual and the collective can simultaneously attain equal importance: a most elevated state of being. They returned to Café Oto in Dalston this week and once again there were long stretches of time during the evening when I found myself wondering why I would ever bother to listen to anything else. That’s not a response that withstands interrogation, but you probably know what I mean: on a really great live music occasion, that’s how it gets you. In this case it was justified by the sheer inclusiveness of the music made by Louis and his colleagues: Jason Yarde (saxophones), John Edwards (double bass) and Alexander Hawkins (piano). It seemed to contain just about everything you could ever want to hear. Again, a sort of illusion; but what a noble and magnificent one. This is a band that forces you to drop whatever guard you had up when you arrived, and almost everything they played in their course of two long sets was a highlight. The bits I particularly remember included a surging version of Pule Pheto’s “Dikeledi Tsa Phelo”; a wonderful deconstruction of “If I Should Lose You”, composed by Ralph Rainger for the 1936 remake of Cecil B. DeMille’s Rose of the Rancho; a gorgeous irony-free version of “What a Wonderful World”; and one of the greatest of all modern jazz ballads, Dudu Pukwana’s “B My Dear”. The audience’s response was as wholehearted as the music. All four musicians seemed to be operating at a level where personal freedom and group interdependence achieve a perfect unity. The way they negotiated the transitions made it very hard indeed to believe that they have played only a handful of gigs as a unit, with Moholo and Hawkins keeping a particularly sharp eye on each other as visual and verbal cues were exchanged. Yarde, who started both sets on a black-lacquered baritone saxophone before moving up the registers to alto and soprano, was consistently impressive, channelling the spirits of Bird and Dudu through his broad-grained sound. And what a treat it was to hear the mighty Edwards slip into passages of driving, huge-toned 4/4, walking his lines like Paul Chambers or Leroy Vinnegar. You need big chops and big ears to play like this, and an even bigger heart. This sounds great. You were fortunate to see such a performance. I know that feeling when the music seems like it’s all you need. I could listen to “You Ain’t Gonna Know Me ‘Cos You Think You Know Me” forever – http://www.youtube.com/watch?v=CJlP7nX_qtY. 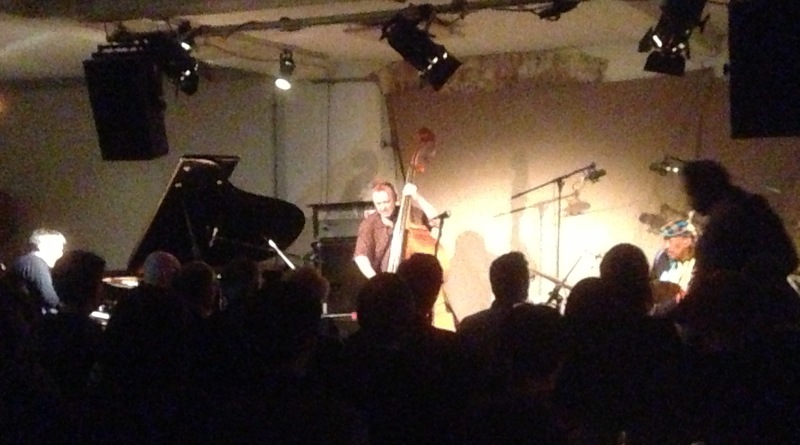 I wish I’d been at Café Oto. Great night of music and a fine review – I can even make out he back of my head in your photo! If I’d spotted you there I’d have had to accost you to say how much I enjoy this blog – but I didn’t and so you were spared! Terrific review, thank you, and only wish I had been there. Yes, I saw them in Sheffield a few months ago, at a venue virtually at the end of my street. They were all just terrific, raised the roof, and got the audience response they richly deserved. I just floated back home after it, feeling very lucky indeed…. Wow! That’s all I can say Richard. I think I know what you mean when you describe this concert. Thanks for your words.